With nearly 1.5 billion monthly active users, Gmail is easily one of the most popular free email services in the world. Despite offering many attractive features, there’s a lot of things Gmail can’t do, which is where Gmail add-ons and third-party email organizers such as Clean Email come in. It’s easy to forget that Gmail launched back in 2004. A lot has changed since then, and Gmail now has so many features that most users barely scratch the surface of what it can do. But what if you’re not like most people? What if you like to take advantage of each and every feature available to improve your productivity and enhance your email workflow? In that case, you will be pleased to know that you can make Gmail even smarter and more capable than it already is using Gmail add-ons, which have been supported since 2017. An add-on is a piece of software that enhances another software application. As such, Gmail add-ons are not independent applications that can be run on their own. Instead, they integrate with Gmail, allowing you to customize your email experience in many exciting ways. To ease you into the world of Gmail add-ons, we’ve selected 5 best Gmail add-ons, making sure to include something for everyone. Included are the best free Gmail add-ons, the best Gmail add-ons for business, and also a bonus for those who would like to take their inbox management to the next level and spend less time organizing emails and more time being productive. Dropbox is a popular cloud storage service that started in 2008 as a modern alternative to transferring files on USB flash drives. Since then, Dropbox has been translated into 17 languages, and the service is available for all major operating systems, including Windows, macOS, Linux, Android, and iOS. What’s beautiful about Dropbox is that the service allows you to access your files from anywhere. Let’s say you’re visiting your parents for Christmas and suddenly remember that you haven’t yet sent an important email with a PDF attachment to your boss. 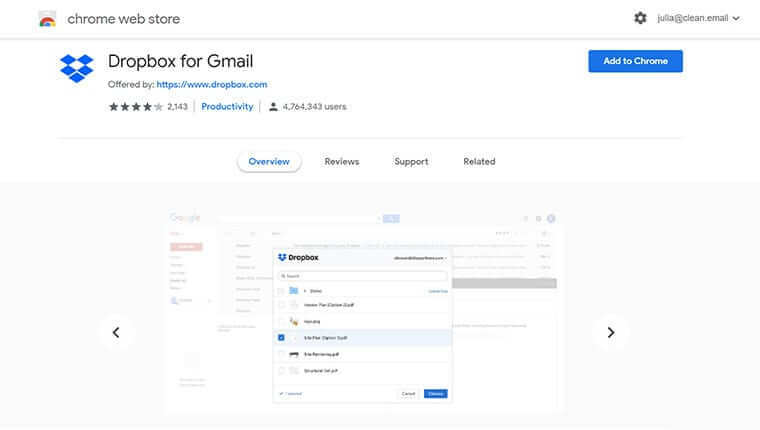 With this Gmail add-on, you can simply retrieve the file from your Dropbox cloud storage without leaving Gmail and send it with a single click. Yes, you could also just open Dropbox in a web browser, download the file to your device, and include it as an attachment, but that would take an unnecessarily long time. Considering that it takes just a few seconds to install the Dropbox add-on, using it is a no-brainer. Boomerang is one of those best add-ons for Gmail that you won’t be able to live without once you discover how powerful it is. 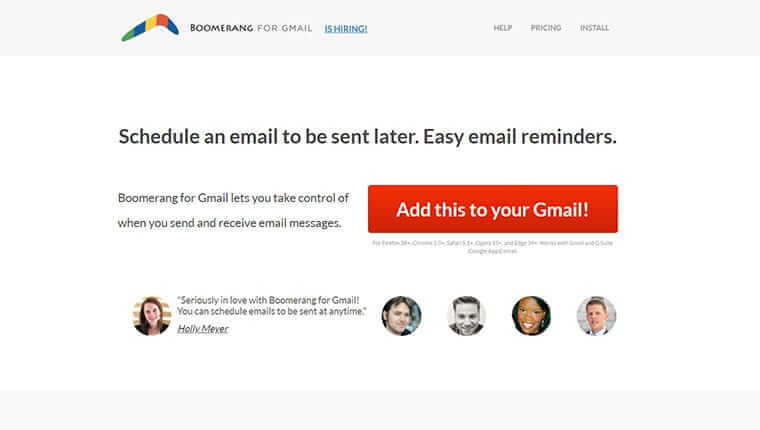 Essentially Boomerang lets you take control of when you send and receive email messages. It adds a second send button and a handy calendar picker that allows you to tell Boomerang when to send your message. Once an email message is scheduled to be sent in the future, you don’t even have to be connected to the internet for the message to be delivered. Besides scheduling emails to be sent later, Boomerang can also take messages out of your inbox until you actually need them. If you send just 10 emails a month, you can use Boomerang for free, and unlimited plans start at $4.99 a month. We let you decide whether they’re worth it. Do you often get emails from recruiters, companies, and potential business partners? If so, you probably know how difficult it can be to tell which of them are legitimate and which have been sent by spammers and phishers. With Discoverly, you can easily deep dive into social media networks to find information about senders. 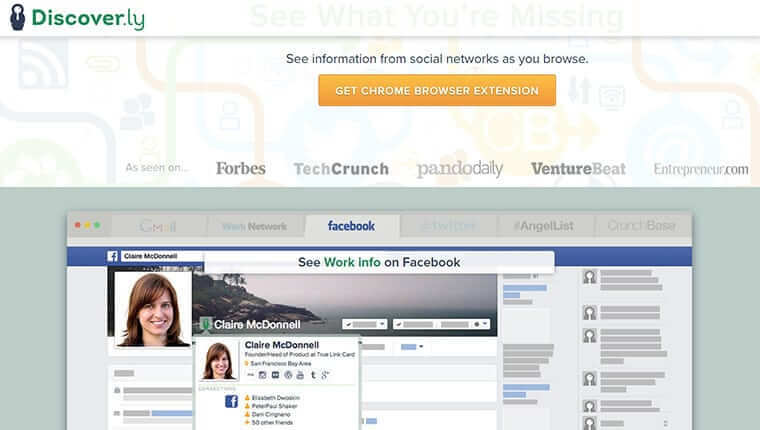 With a single click, Discoverly looks up contacts in Gmail, LinkedIn, Facebook, and Twitter to find mutual connections, tweets, Facebook posts, LinkedIn profiles and blog posts, and much more. Discoverly works with Boomerang, and we highly recommend it to job hunters, salespeople, recruiters, entrepreneurs, and just about everyone else who doesn’t enjoy responding to emails from unknown senders. To make a good first impression in real life, you have to dress well, present yourself appropriately, have a winning smile, be open and confident, use small talk, speak clearly, make eye contact, use body language, and much more. But how do you make a good first impression when sending an email? With a gorgeous email signature! 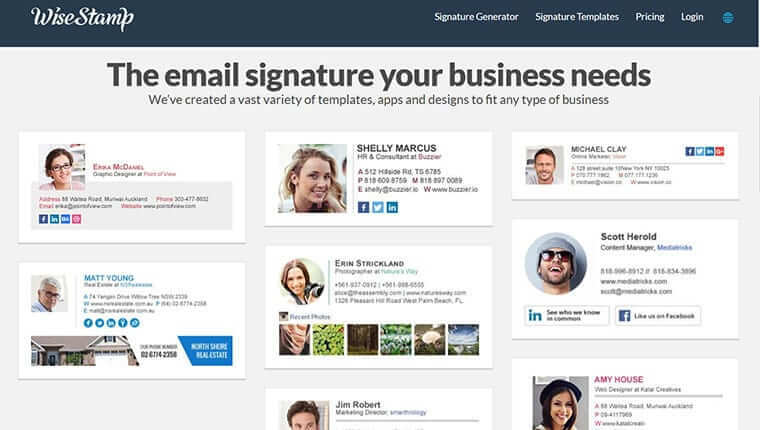 WiseStamp is an online service that lets you quickly and easily generate a customized email signature using a vast variety of templates, apps, and designs to fit any type of business. WiseStamp has already helped over a million professionals improve their online image, and it can do the same for you. WiseStamp is free to use, but you need to upgrade to a paid plan to unlock all features. As you may already know, Gmail supports a ton of keyboard shortcuts to allow its users to compose emails without taking their hands off the keyboard. The only problem is that there are so many of them that remembering them all—or even a small fraction of them—can be a challenge. Fortunately, there’s KeyRocket, a simple Gmail add-on that tracks every move you make in Gmail and suggests appropriate keyboard shortcuts, helping you learn them naturally. 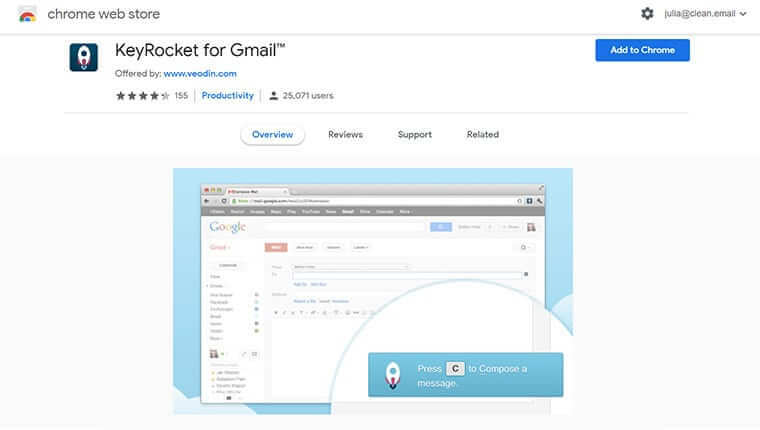 KeyRocket is free, and it doesn’t collect any data on your Gmail usage. Clean Email is a third-party service that works with Gmail as well as with several other email services. The purpose of Clean Email is to help email users achieve and maintain Inbox Zero, which is a rigorous approach to email management aimed at keeping the inbox empty at all times. Instead of managing emails one by one, Clean Email organizes emails in groups, allowing you to act on multiple emails at the same time. Besides making it possible to clean up your inbox with only a few clicks, Clean Email also ensures that your inbox stays empty going forward. It can intelligently unsubscribe you from newsletters and other unwanted subscriptions, block senders, and automatically apply selected actions to emails as they arrive. Gmail add-ons are handy when you want to use Gmail to its full potential and take your productivity to the next level. Most Gmail add-ons are free, and those that aren’t are usually very affordable, especially considering how much time they can save you.